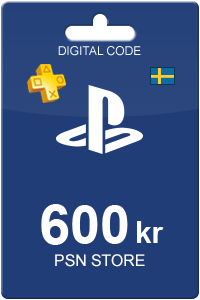 PlayStation Network Card 800 SEK product is a digital code, once bought, the code will be sent to your email or can be downloaded directly from your screen. These codes are original and produced by the developer. These codes have no expiry date. If you like making purchases in the PlayStation Network Store, it can be quite convenient and necessary to have credit on your account. With the PlayStation Network Card 800, it is easy to fill up or top off your account. Please note: this PlayStation Network Card is intended for Swedish account holders. Be advised prior to purchase. With the PlayStation Network Cards, you can deposit various values onto your accounts. The cards can be used with a PSP, PS3, PS4 or PS Vita. You can purchase all different kinds of content in the Sony Entertainment Network Store and the PlayStation Store. The amount of digital products of these stores is huge! You will find movies, games, music, avatars and extra content amongst others! With these cards, you no longer have to pay with a credit card. Since we provide your code upon payment, you can begin downloading your favorite content immediately! We offer various Playstation Network Cards valid for Sweden accounts. Besides the PlayStation Network Card 800 SEK, we also offer other amounts so choosing an amount which fits your account is easy. Ordering a PlayStation Network card is simple. You fill in your personal information and pay your preferred payment method. Afterwards, the code will appear on your screen and is also sent to your email for you reference. The code can be redeemed on your console, and you can start purchasing immediately! How to buy PlayStation Network Card 800 SEK? Buying PlayStation Network Card 800 SEK from Livecards.eu is as easy as 1 2 3! Simply fill in your email address, select a payment method and complete the payment! We have some of the cheapest PlayStation Network Card 800 SEK on the market.